Professor Shapir received his BS in physics (1971) and his PhD in physics (1981), both from Tel-Aviv University. After positions as a postdoctoral associate at the University of Illinois (1981-83) and as Assistant Physicist at Brookhaven National Laboratory (1983-85), Professor Shapir joined the University as an Assistant Professor of Physics in 1985. He was promoted to Associate Professor in 1991 and to Professor in 2000. Professor Shapir also holds a joint appointment as Professor of Chemical Engineering. 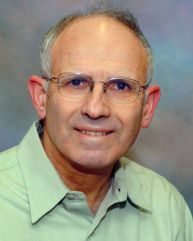 Professor Shapir has been the recipient of the Fulbright Award (1981), the Bourse Joliot-Curie (1982), and the Visiting Compton Fellowship at the Technion (1989-90). Professor Shapir's research interests are within the fields of theoretical condensed matter physics and statistical mechanics, including: critical phenomena in ordered and disordered systems such as spin-glasses and random-field systems, classical and quantum transport in dirty metals and the metal-insulator transition, statistical properties of different polymer configurations, fractal properties of percolation and other clusters, kinetic models of growth and aggregation.